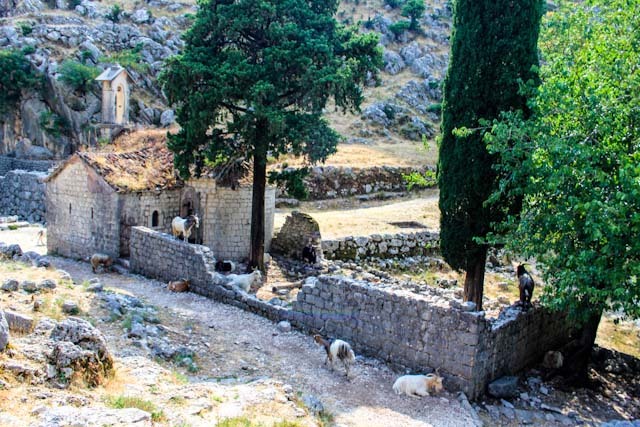 The old route from Kotor to Njegusi, an old legendary route who lost has glance, is slowly stepping out the shadows of the more well know sibling, the serpentines of Kotor, known for its U-turns and far sights. But before his siblingwas giving passage to his own people and visitors going up to the mountainous inner parts of Montenegro, it was him bringing them up with even more serpentine’s. Only with the small differences of legs, instead of tires, and also little less in gear. The old road zig zaggin down. This route was for centuries the only connection road between Cetinje and the old Montenegrin state and the coast. Until 1879 was the only path into, until the Austrians started in 1879 the building of the serpentine under engineer Josip Slade, from Trogi) and was finished in 1884 for military purposes. Before that in 1822 they already reinforced the caravan route, especially in the beginning were the space is permitting it the most. 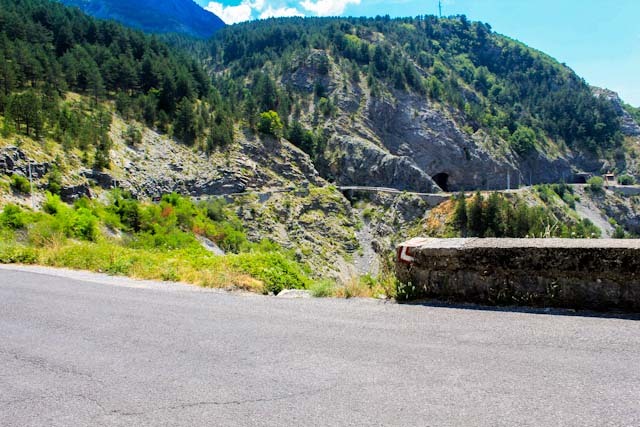 Most notable by the large stone blocks at sides of the roads, trying the hold the road together for more 200 hundred year against wind water and glacial erosion. It leads to the Krstac pass at an altitude of 940 meters. From it continues to the historical village of Njegusi known for it’s smoked ham and being the birthplace of Petar II Petrović Njegoš. The old route is known for the legend for solidifying that all kings have their special needs, and that King Nikola wasn’t a exception at it. He wanted to have his in own billiard in his palace in Cetinje, with the given the facts that it had to be imported to the harbor of Kotor, and that the route isn’t much wider in the higher parts than his wife’s suitcase, and steep enough for good a ski descent. Perhaps in that period billiards were made lighter and more bendable ? But as a good king is fitted, Nikola got his own billiard table. Old postcard showcasing the little vegetation presented then. Another personal legend is my old man telling for many times how he in his physical prime a truck driver refused to take him along when he was hitchhiking and he got so mad about that he used to old track the outrun the truck and give the driver a warm greeting at the main road down to his own pleasure. 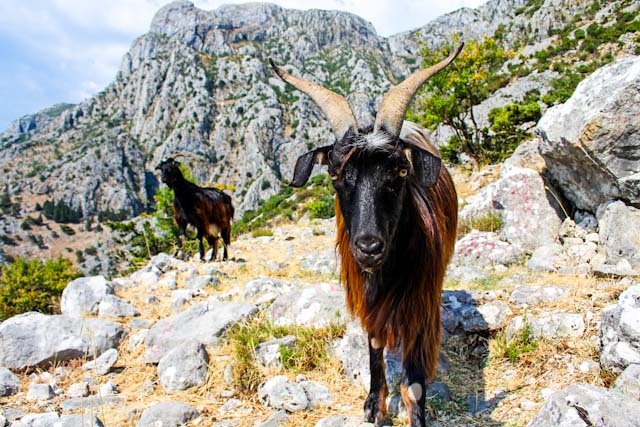 For many years it totally got forgotten, losing its purpose the upcoming of the car and disappearing of traditional Katun way of life, with almost all people having their own livestock. But after the redecorating and comprehensible marking by the National Tourism Organization the route gradually is getting more and more strolled, but now in recreational way. The route is getting popular because its length, location and scenery. Going which direction mostly is depending on the persons staying or going too. One thing they have in common finding the entrances to the route are probably the hardest part when navigating it. The most satisfying way to walk for most people probarly is going down. Starting from Krstac and ending in the old town of Kotor. A surplus would be when you haven’t yet visited it, so it’s beauty would surprise you more, and you could relax nicely on one of the many terraces and also finding accommodation would be much easier. And going down always is little more effortless than going up, could also be a good argument as well. Entrance to the trail from Krstac. So starting from the top, the entrance is a little bit hidden behind the asphalt stone barriers, around 50 downhill meter from the recently opened zip-line. It starts sandy going rapidly over in the old remnants from the old Austrian reinforcements, being covered with loose stones. This part of the trail certainly is the hardest steepest part, with many stones that won’t stand still when stepping on them, and creating some mini avalanches. Along the way you would notice some car’s tires lying spread, and even a jeep wreck. Luckily these are not the marks of some tragic fatal accidents, but people’s interpretation of bringing there car to the junkyard. What used to be done in the past. And many Lada found his rusty grave there between the pines. It used to be many more but around 10 years ago the ministry decided to clean it up. After a 300 meter decent, you will see a little stone bridge you have to cross. Here once was a watermill were the locals used to bring there wheat to got it grinned. From here the path becomes a small sandy one continuing straightly through the pine forest. Your knees thankfully welcoming this easier softer surface. 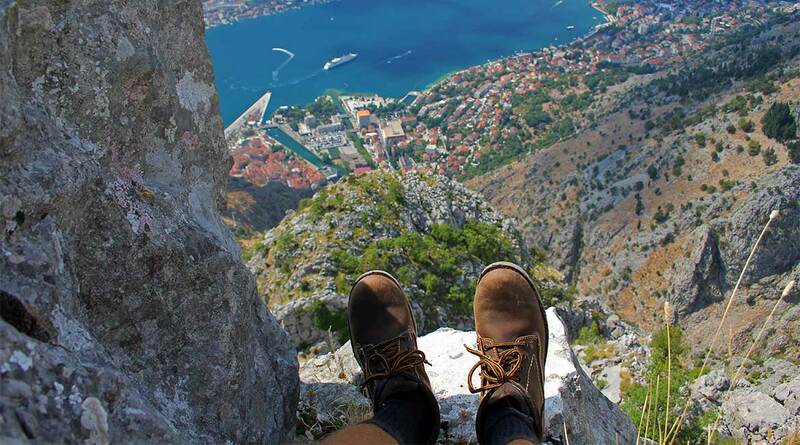 From here you will see the first glimpses of Kotor, Prcanj and Dobrota. A fun fact is the probably you assume that this pines are growing here for ages, but a 100 years ago all of these mountain slopes were barren, offering not much than rocks making it a good reminiscent of the moon-like parts still seen at places in the Lovcen national park. Under Tito regime they started to plant these tree´s for firewood. The hardest steep part leading or leaving up/of to the 940 m altitude at Krstac. by A. den Doolaard were even more appropriated that time. Descending down passing an old little bridge. 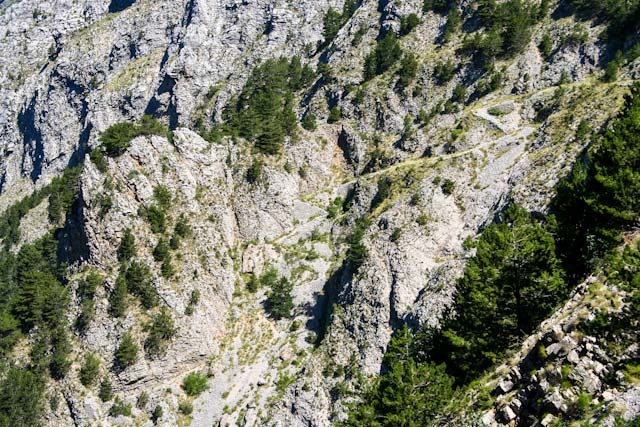 This pine trail will quickly stop and open up in yellow grassy hill, given views of the Tivat part of the Boka Kotorska Bay and the Vrmac ridge that’s dividing the bay parts. Still heading in straight line slowly descending, making it the easiest part of the hike. But as all good things must come to an end, suddenly there comes a sharp bend to the right and u will have an amazing view of your end station, the old town of Kotor. The small pine forest part of the trail. And from here the farther is demonstrating who laid the fundamentals of the art of serpentine’s. Bend of bend slowly descending to the outer walls of the Kotor’s old town fortification. The path now becomes wider and the outside fundamentals are still there, although having lost much of his former glory. The U-turns are racking up fast now, and makes you understand how it makes an impressive total of 70. Each turn giving u a better view of the old town and the bay, and each turn bringing you closer back to daily life. At this point you could be greeted by the most loyal visitors of this area, their existence almost always being betrayed by sound before seeing them. The goat herd that roams here all year. Nobody knows it better than them here, and they will come out of nowhere, showing casing you the finer shortcuts and how it’s really done. Even some personal inspection could come in place for who is visiting their realm. And this is like a real habit done by the biggest he-goat of the pack, and some food bribing could be in place as well. Continuing you will shortly will find out to who they are contributing too. A lovely small stoned house idyllic looking at the old town’s outer walls, and the bay. If you like they made a little bar at the house and some refreshments like soft drinks, beer and water can be bought here. This house is not only the indication of coming back to civilization. You will start to notice the people that reached the peak of the fortress at first, relaxing at the end of their little hike and enjoying their view of the surroundings. First inspection before going into their domain. The most curious ones find a way through the wall and start to wander around being surprised that is still more behind the walls, and their path to the top was just a small part of what could be done. And wisely they decide to walk a little up to return the fortress after. Remaining with the questions, were does it go and were does it end ? But their curiously for surely is rewarded, just behind the wall you will run into St George’s (Sveti Djorde) chapel hidden in the valley. Which was protected over the centuries by it’s hidden location after the high fortified city walls. But time and isolation made their marks on it, giving it a strange feeling of desertion which it’s fallen down walls and grass grown roof. With the human presence gone it looks the goats decided to make it their sanctuary, relaxing in the walls shadows. With the limestone cliffs, the bay, the city walls nobody can resist to stand still here for a second and just look around. Noticable is that walls here looks so much more higher and inaccessible than at seaside. It looks like they were much more afraid from the inner lands than the foes coming from sea. The old historic headquarters located. Here u can decide to continue the old caravan road or climb to a small window in the wall too the John’s fortress and walk down with the other visitors into the old town (30 minutes shorter). And proudly strut that you can came here without paying the entrance cost’s for climbing the St John’s castle. But when you decide to finish what started u will need to conquer the last hairpins coming at you at a faster growing rate, finally ending at the old water power plant located at small Skurda river. Walk down with it path and you will arrive at the North Gate of the old town. When not visited it yet, make certain you take here a left bend crossing the bridge, and see that beauty of the old town is a nice as the views of it. Find one of the many good café’s, sit down make your knees rest and just relax. For those already visited the old town you probably made this suggestion for yourself a long time before. 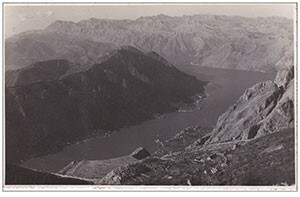 The start of the serpentine’s and open views of the Kotor bay. The remainings of the Austrian fortifications. The entrance to trail from the St John’s castle. The fortress seen from seaside and the entrance at the Skurda powerplant. •	Starting point(s) = Old town of Kotor (Skurda power plant or St John's fortress) & Krstac close to the last bend seeing the bay and nearby the Zip-line station.